How to place four identical bottles in the plane such that the distance between each pair of mouths will be the same? Denote the height of each of the (identical) bottles by $h$. Draw a square with side length $h$. Put each bottle on each of the vertices of the square, where each pair of bottles standing on the same segment stand in such a way that one bottle is standing on the base and the other is standing on the mouth. 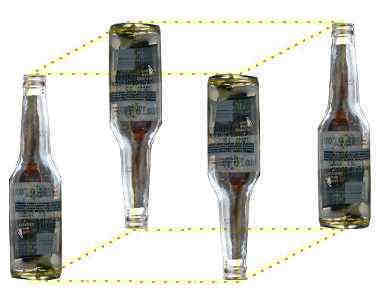 This way the bottles form a cube, the distances of the mouths are the diagonal of the 6 facets of the cube (see picture). Since the facets are congruent squares the mouths of the bottles are equidistant to each others.